Last week’s volatile price action by the March U.S. Dollar Index was all about the pace and the timing of the expected Fed rate hikes. The greenback broke sharply for two days last week on negative news about the pace of the rate increases, but managed to rebound at the end of the week, following the release of more upbeat news. The U.S. dollar broke sharply on February 3 when the U.S. ISM Non-Manufacturing PMI data missed the estimate. The report showed a reading of 53.5 versus an estimate of 55.1. It also meant that the U.S. services sector expanded in January at its slowest pace since 2014. The miss by the ISM Non-Manufacturing PMI data had a domino effect on the financial markets. U.S. Treasury yields began to tumble with the U.S. 10-Year Yield briefly falling below 1.8 percent at 1.793, near a 1-year low. Fed funds traders reacted to the news by pricing in a less than 30 percent chance of even one rate hike in 2016. The forecasting tool showed that the financial markets were now assigning no higher than a 28 percent chance at any meeting this year, and just a 31 percent chance of a rate hike at 2017’s first meeting. The result of the steep drop in treasury yields was a sharp plunge in the U.S. dollar. The greenback suffered its worst day in seven years. Compounding the problem were comments from New York Fed President William C. Dudley, who said in an interview with Market News International that policy makers are “acknowledging that things have happened in the financial markets and in the flow of the economic data that may be in the process of altering the outlook for growth and the risk to the outlook for growth going forward”. By Friday, February 5, a completely different picture started to develop after data showed a pickup in U.S. wages in January, suggesting greater inflation and diminishing the view that the Federal Reserve would not hike rates at all this year. According to the U.S. Labor Department, average hourly earnings increased 12 cents, or 0.5 percent, last month, leaving the year-on-year gain in earnings at 2.5 percent. This was 0.5 percent higher than the 2.0 percent inflation figure the Fed was hoping for. The strong wage data was enough to drive the dollar higher even as the headline non-farm payrolls increased by just 151,000 jobs last month, below the 193,000 that economists were expecting. The unemployment rate also fell to 4.9 percent, the lowest since February 2008. So while the dollar plummeted earlier in the week on the view that weak domestic economic data and worries over the global economy could prevent the Fed from hiking rates this year, as well as dovish comments from the Fed’s Dudley, it closed the week on the notion that maybe there will be at least one rate hike after all if we see more stabilization and improvement in the domestic and global economies. Technically, the March U.S. Dollar Index posted a potentially bullish closing price reversal bottom on Friday. We feel that given the better-than-expected U.S. labor report, the upside momentum created by Friday’s move should carry over into this week. We’re not looking for a change in trend because there are still too many negative variables working against the dollar at this time, but we do feel that the greenback is due for a price adjustment. 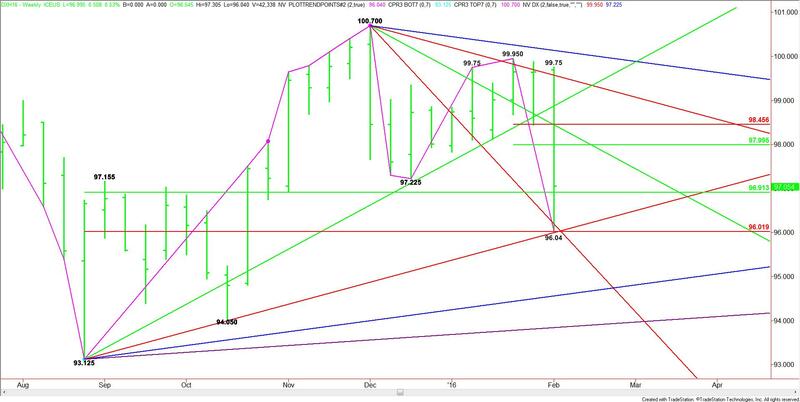 The first sign of strength next week will be an opening over a downtrending Gann angle at 96.45. This could occur fairly easily with just a flat open since the market closed at 97.05. This angle stopped the rally on Friday so crossing to the strong side of it will give it an early upside bias. The breakout to the upside should occur when Friday’s high at 97.31 is taken out. Since there is room to the upside, this move may trigger a price acceleration. Based on the range created by the January 21 top at 99.95 and the February 5 bottom at 96.04, the first objective to the upside is its 50% level at 97.99. If the buying is strong enough, the next objective is the Fibonacci level at 98.46. By looking at the weekly chart, we can see that last week’s low at 96.04 wasn’t just random. The bottom occurred inside a major retracement zone and slightly above a major Fibonacci level at 96.04. Friday’s close was also on the strong side of the major 50% level at 96.91. Because of the way the market rebounded on Friday, we could still see some consolidation inside the 96.91 to 96.02 retracement zone, but once we clear 97.31 and sustain the move, we should reach our minimum objective of 97.99. Once again, we’re not looking for a change in trend, but a retracement of the recent break. We feel that sellers may have overdone it on the downside. Additionally, we feel that the economy is not as weak as perceived early last week given the stronger-than-expected U.S. jobs report.